Colors: Agouti, broken, pointed white, self, shaded, ticked, or wide band color groups. Besides having the characteristic floppy ears, Mini Lops have a muscular build with broad shoulders, deep chests, and short, thick legs. Their adult size is generally only about 2 to 2.75 kgs. 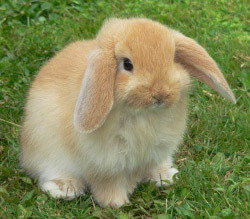 In general, the mini lop is a very sweet breed. They tend to be a little less active than some breeds, but there are definitely some clowns among the breed. They thrive on attention..